Our range of products include groove tool. 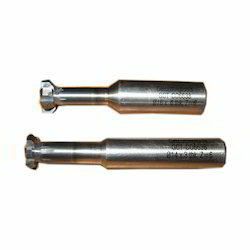 We are counted amongst the recognized organization offering of premium quality Groove Tool. The offered tool is largely used in various mechanical and high power installations. This tool is manufactured using quality stainless steel alloy and approved technology. At our manufacturing unit, engineers can develop the tool according to the specifications provided by the clients. Manufactured adhering to industry standards, this tool is made available in various lengths and diameter at reasonable prices.